I usually don't allow my son to use his laptop on school days. However, I find it difficult to impose this rule nowadays as he often needs to do Internet research for his school projects. He also works on his articles for their school paper and his reports for his other subjects using the computer. He prints and submits school requirements almost everyday especially now that he's in the 5th grade already. The Internet has now become an indispensable learning tool for students. I should now, since I work for WikiPilipinas, Vibal Foundation's digital encyclopedia dedicated to Pinoys.We may not acknowledge it directly but kids who have direct access to the Internet at home are a step ahead of those kids who are "computer-less" and "Internet-less." Yes, we have textbooks and we also have public libraries that provide much-needed information but information on the Internet is delivered faster and, most often than not, it is more updated. Thus on its 75th year, P&G, makers of our trusted Safeguard, Tide, Pampers, Downy, Ariel, Pantene, Head & Shoulders, Joy, Rejoice, Whisper, Olay, Gilette, Vicks, and Ambi-Pur, realized the importance of helping less-fortunate school children have access to computers and the Internet. Through its e.Studyante program, P&G has partnered with other institutions to fulfill its goal of providing one laptop per child or a total of 1 million laptops by its centennial anniversary. 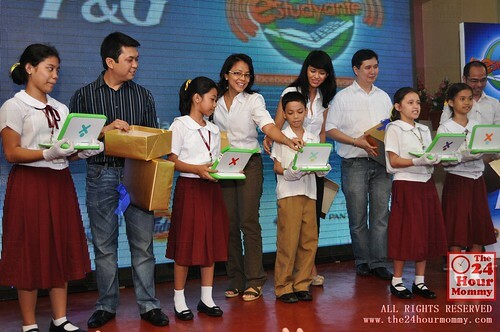 Students from the Manuel L. Quezon Elementary School in Tondo, Manila were the first ones to receive the free XO laptops. Moreover, P&G employee volunteers helped them use their laptops for the first time. They even sent an email to no other than President Noynoy Aquino himself. 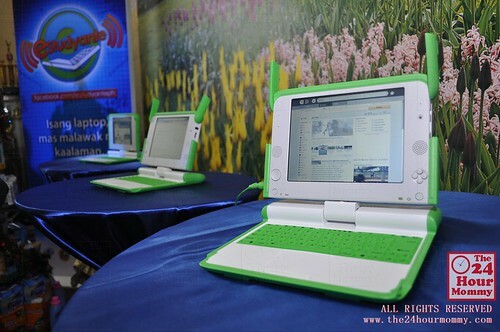 According to Chad Sotelo, P&G Country Marketing Manager, they will be distributing a total of 400 laptops to five schools in the country in the next few months. To reach the goal of 1 million laptops, however, the company asks the public to support the e. Studyante program by buying specially marked P&G promo packs of the brands I enumerated above. A portion of the profits generated from the sale of these promo packs goes directly to the e. Studyante program. Meanwhile, Smart's Public Affairs Group head, Ramon Isberto, reaffirmed their company's support to the program by providing Internet connectivity that will surely help the student beneficiaries in their studies. I hope that you can choose to buy these specially marked P&G promo packs on your next trip to the supermarket. I have witnessed the happiness, not only of the students, but also of the school officials, during the turn-over ceremonies. The principal even said, "Ngayon, magkakaroon na tayo ng computer laboratory!" (We will now have a computer laboratory.) Apparently, these kids do not have computer classes when the subject is already a given in private schools. great!! ill support that promo!! thanks for the infromation po talaga.. sana all of the schools will be given para high tech and fast learning na ang mga kids!! hindi yata siya for sale. para lang siya dun sa project.